I shared in my Review for the ???? 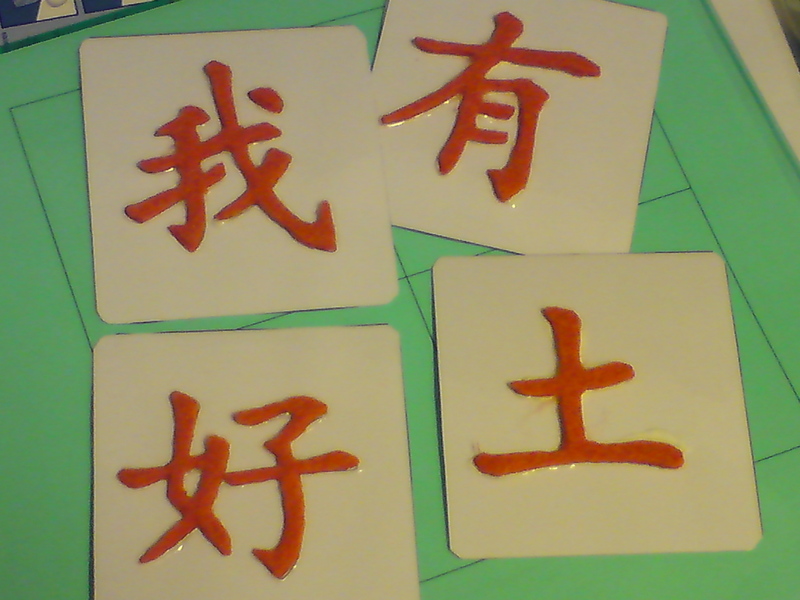 seriesthat I made tactile Chinese Character Cards to use in conjunction with the book. This is a step-by-step instruction of how you can make tactile cards using sandpaper or felt. I use felt because it is cheaper and easily available from Daiso (Japanese $2 store selling practically everything under the sun and more). 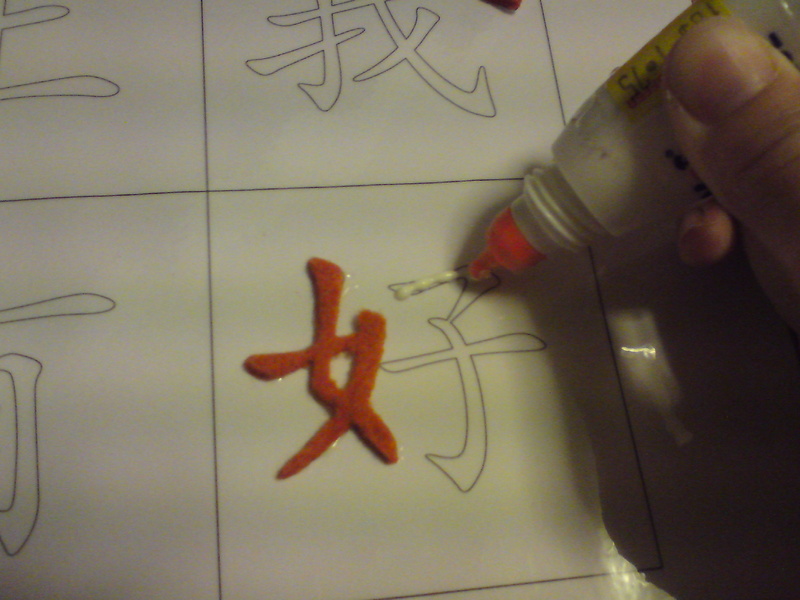 You can actually use the same method for making tactile cards for anything, including alphabets and numbers. 1. A pair of small, sharp, pointed-tip scissors for cutting intricate details. I use embroidery scissors. 2. A pair of normal scissors for cutting other things. 4. Felt, preferably the kind that is not too thin and easily torn, or gets wooly easily. Print out one set of the words on normal printing paper. Print a second set on stock card paper – I use 160gsm paper. Laminate the 2nd set that is printed on the stock card. Cut out the individual square cards. Snip off the corners to prevent injury to little hands. Set aside. Take the 1st printout that is on normal printing paper. Cut out a character. You will end up with pieces of the different strokes, or a whole piece of a few strokes joined together, depending on the character. Take care not to mix up the strokes with strokes from other characters. The easiest way is to do one character at a time. 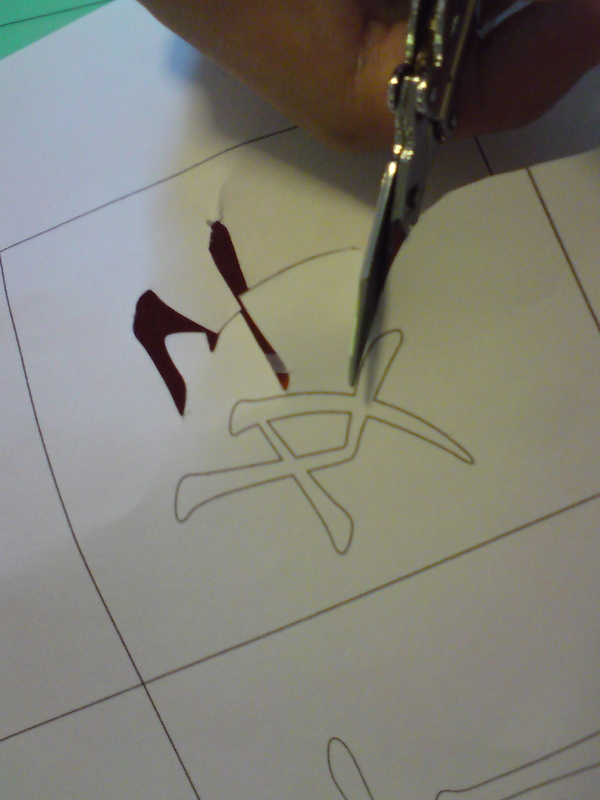 With the cut-out facing the right way up, apply white craft glue on the “Right” side of the paper. 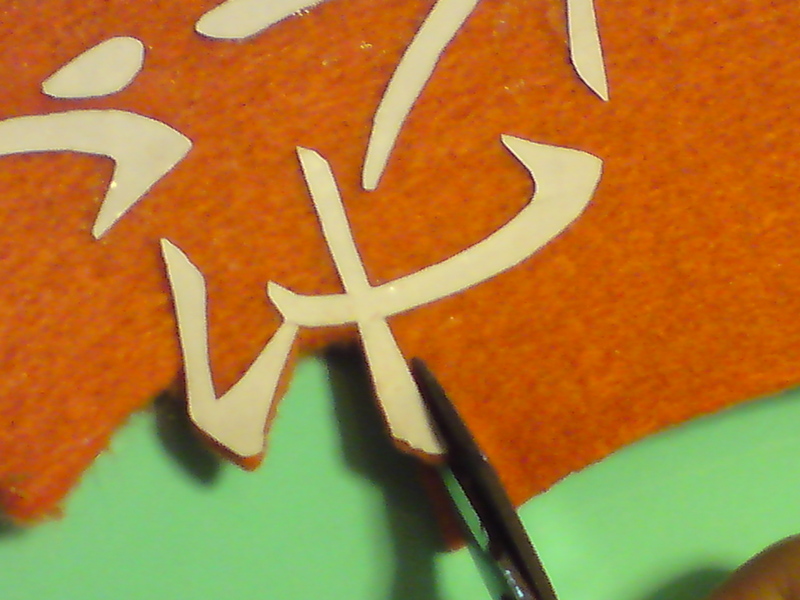 Paste the cut-out on your felt, “Right” side attached to the felt. Now you should see the “Reverse” side of the character facing you. 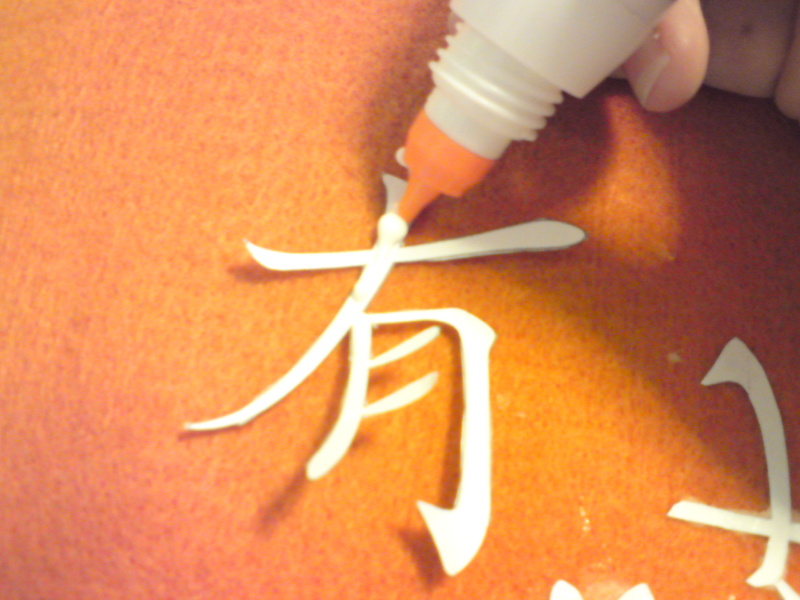 The craft glue will become transparent when dried. When the cut-out is securely attached to the felt, i.e. when the glue is dried, using the paper cut-out as a guide, cut the felt piece out with your small, pointed-tip scissors. You don’t have to remove the paper backing. Now, take out the corresponding laminated card of the character. 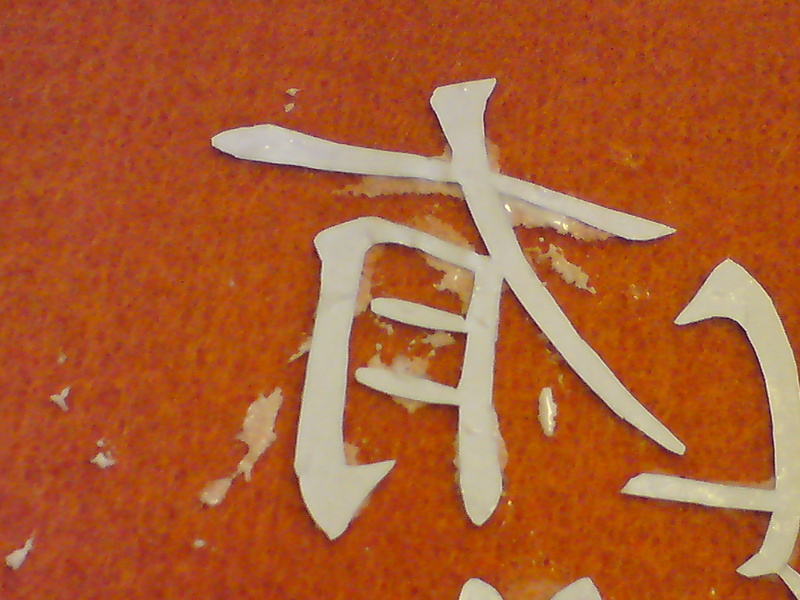 Apply white craft glue on the strokes. Finally, stick the felt pieces you have cut out in Step 6 onto the laminated card. Leave to dry completely. I prefer to use felt instead of sandpaper because felt is kinder on the scissors than sandpaper. I used sandpaper to make tactile cards once and at the end of the exercise, I had to throw away my scissors. Felt is definitely gentler on the hand also as it is easier to cut. Felt is also cheap and easily available from Daiso. On top of that, felt allows me to colour-code my cards. I use different colours for the different lessons. That’s why felt remains my favourite material. Besides sandpaper and felt, you can also explore using foam sheets, if cost is not a concern. – Apply glue on the laminated card and pour craft sand/glitter over it. 3. I have seen people using textured wallpaper. 4. Use those polyfoam clay sold in the craft section to form the characters, then stick the foam onto the laminated card. 5. If you don’t mind NOT having tactile cards, you can print out the template on stock cards, let your child colour the characters, then laminate. The template that I have made for the tactile cards can also be used for practising writing. Print them out on stock card and laminate. Cut out the individual cards and let your child write over the hollow characters with a dry-erase marker (i.e. whiteboard marker). You can erase and write again and again. 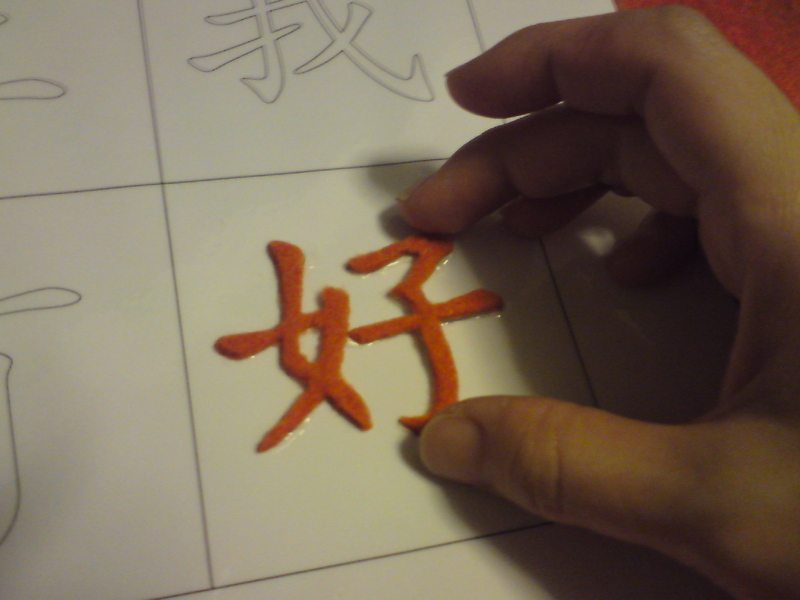 The templates for the Chinese Characters can be downloaded here.